Most of our charters are done on the magnificent lake of West Lake Tohopekaliga also called Lake Toho or West lake by the locals to discern it from the nearby East Lake Tohopekaliga. It is just minutes from Disney world and Orlando. The name Tohopekaliga comes from the Seminole Indians who lived nearby and it means “we will gather together here”. Shallow flats of maidencane, bullrush, and hydrilla help to fortify large populations of baitfish and bass. In addition to prime vegetation, the bottom of Toho has been improved by allowing extreme drawdowns to the lakes water level. During the drawdowns, bulldozers remove deposits of muck from shoreline areas, simulating a natural drought. The shoreline of Toho is now prime for spawning bass. The lake is 22,700 acres and is one of the most famous bass lakes in the entire country. Know for constantly producing more big bass than any other lake. 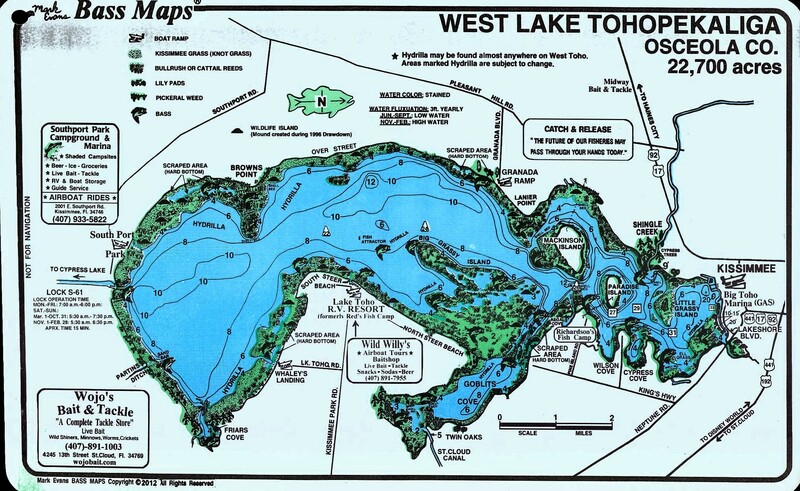 Even with the increase in fishing pressure from its fame, Lake Toho continues to produce, with Bassmaster magazine in there 2016 issue of top 100 lakes calling Toho “the most consistent lake in the country for producing both numbers and Trophy sized bass”. Many big tournaments are held on Toho yearly with the biggest being Bassmasters and FLW events. 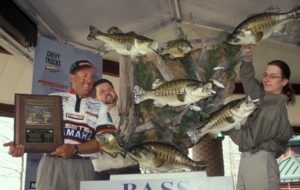 The lake holds many records with the most famous being the heaviest 5 bass limit in B.A.S.S history, caught by Bassmaster Elite series pro Dean Rojas in 2004. His record of 5 fishing weighing 45 pounds 2 ounces (averaging 9lbs per bass) still holds today. During the four day event he finished with a 20 fish limit weighing 108lbs-12oz, which was also a record for a four day event. 21 bass weighing 10 pounds or more were caught during that tournament, and with all those double digit bass being caught no one bothered to count all the 8 and 9 pound bass. Other records include the official lake record which is 16 lbs 10 oz. It was caught by Capt. Ed Chancey (founder of Freelancer Guide Service) on the grass line just south of the locks going to Lake Cypress on a black grape colored Producto Tournament worm. The unofficial Lake record of 17 lbs 4 oz was caught out of a hole back in Shingle creek on a black and blue Culprit worm. The woman’s world record was also caught out of lake Toho and weighed and impressive 14 lbs 5 oz. There was also a 24-lb 12-oz; 39.5 in L; 30 in G bass that was uncovered during a electro-shock survey of the lake in 1974. Obviously this fish is no longer around but it is interesting to see what size bass are lurking in the lake and evading anglers. Much of Toho’s bass fishing is often centered around hydrilla. Locating concentrations of bass in hydrilla can be a challenge. Keep in mind that hydrilla may be growing at many different stages throughout the lake. First look for hydrilla that looks alive with minnows, birds, etc. in the area. Then begin to eliminate water by using moving baits that can efficiently cover large areas. Lipless crankbaits, swimbaits, jerkbaits, and trolled shiners are effective at finding fish. When bass are located you can then slow down and thoroughly work the area. Note the circumstances in which you catch each bass and try to duplicate it. Did the fish hit off a point, in a pocket, off the bottom, or was it suspended? It takes time and effort to dissect large areas of hydrilla but the rewards can be worth it. Always let the fish tell you what they want. Because of the shallow nature of Toho, bass are more affected by weather and water condition changes than bass in other lakes. During the Spring (December- April) Shiners catch the majority of the trophy bass. The standard approach is to anchor a few feet from vegetation in 1-4 feet of water. Swimbaits, lipless crankbaits, and flipped plastic Crawfish account for most of the bass on artificial lures. Keying in on the scraped areas is a good starting point. These areas include Whaley’s Landing, Goblits Cove, inside Brown’s Point, Granada area, and inside North Steer Beach. Summer: (mid April-September) as the seasonal drop in the water level begins in June, many bass move out of shallow water areas and into the deep outside hydrilla or Kissimmee grass. Early morning fish may be caught on topwater baits as well as swimbaits, jerkbaits, and lipless crankbaits. For bright mid-day conditions, flipping a worm or crayfish type lure into thick clumps of hydrilla or Kissimmee grass can be deadly. Lily-pad fishing can also be effective using a swimbait, or plastic frog. Areas of running water should always be fished as baitfish may attract numbers of bass. For summer fishing locations, try Big Grassy Island, Lanier Point, Browns Point, or the many grasslines found on the north end of the lake. Fall: (September-December) The water level from the summer rains is higher now scattering both baitfish and bass. Lipless crankbaits, Swimbaits, and spoons do a good job of locating possible concentrations of fish. Flipping or casting a plastic worm- crayfish, rigged Texas style can then work them over. Schooling activity can sometimes be found where baitfish are abundant. Shiners again become easier to fish as water temperatures come down. General locations to try would be Browns Point, Whaleys Landing, Lanier Point, and North Steer Beach.